Celebrating, Elevating and Uniting Diverse Communities. 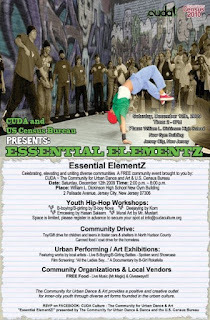 CUDA Culture is pleased to invite you to "Essential ElementZ," sponsored by the U.S. Census Bureau. We would LOVE for you to join us in celebrating the wonderful art forms that help our communities thrive and improve our quality of life. WHEN: Saturday, Dec. 12th 2009 TIME: 2:00 p.m.– 8:00 p.m.
*** Event Volunteers - those interested, please contact Rossana at rossana@cudaculture.org (JC public high school students may be eligible to earn community service hours for graduation). - Deejaying by DJ Korn - Anyone interested in the DJ workshop please email tompremon@cudaculture.org to pre-register for the workshop. Do not forget there are 2 different workshops which 1 is mixing and the other is a battle workshop (scratching, beat juggle,etc). *Space in workshops is limited, please register ASAP to secure your spot at info@cudaculture.org - subject: online registration with your Full Name; Age; School; Email; Phone #. Please pick 2 workshops: 1. being the first choice, and 2. is second choice. - Toy/Gift Drive for Children and Teens in Foster Care & Shelters in Hudson County. LIVE ART WALL for everyone to make & leave their mark! Vendors and local non-profit organizations will also be present (if you are interested in having a table, please contact: rossana@cudaculture.org, subject line: DEC. 12th event). FREE Food*, Live Music & Giveaways!!! 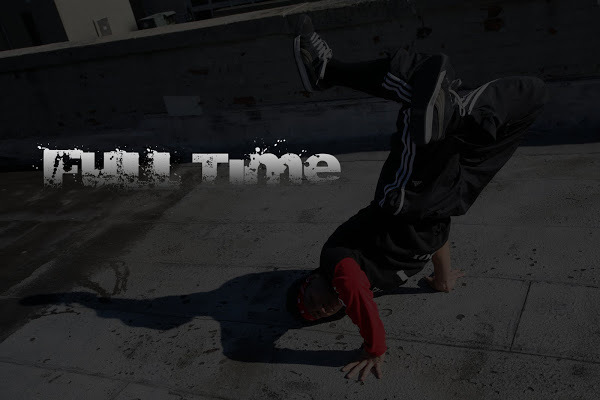 The Community for Urban Dance & Art (CUDA) is a non-profit organization designed for the educational purpose of providing a positive and creative outlet for inner-city youth to practice and showcase diverse art forms founded in the urban culture. 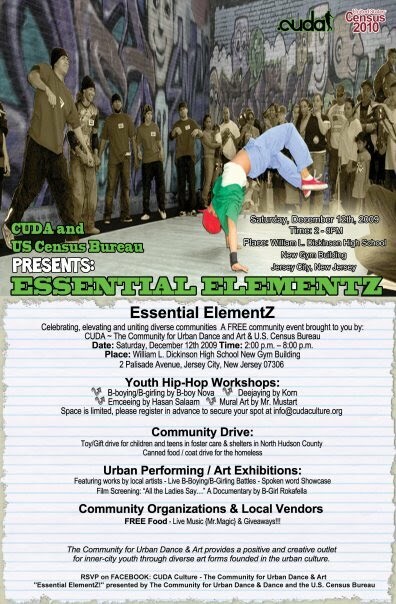 With the goal to stimulate a young person's talents, enhance self-confidence, personal growth, and appreciation for the visual and performing arts, CUDA has teamed up with diverse groups of artists, musicians, dancers and community organizers to make great programs and workshops available for the youth of Hudson County and surrounding areas. We also aim to emphasize and develop skills in self-discipline, teamwork, leadership skills, decision making skills, appreciation of multicultural differences, and community service. With your individual help and support, together we can make our own communities thrive by providing more opportunities for our young people to reach their highest potential.